At the Apply step of the wizard, review what Veeam Backup & Replication components are already installed on the server and what components will be installed. 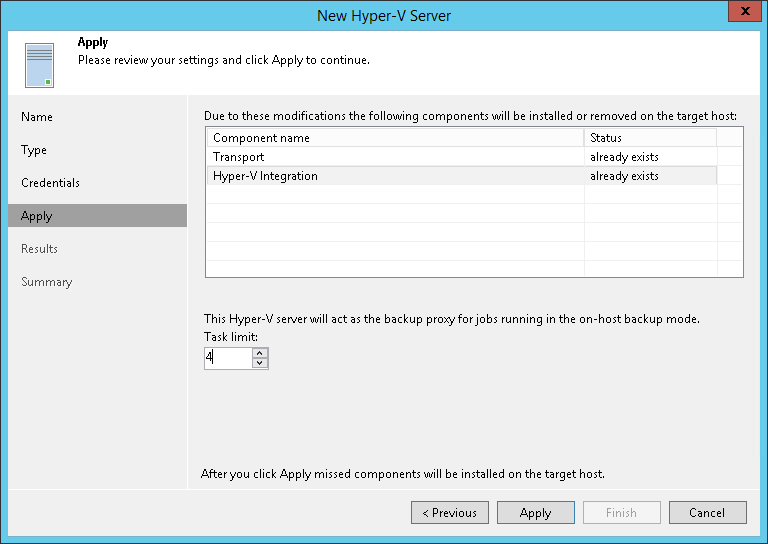 If you add SCVMM or a Microsoft Hyper-V cluster, Veeam Backup & Replication will check every managed Microsoft Hyper-V host to install or update the components. If you do not plan to use some Microsoft Hyper-V hosts for data protection operations, you can clear check boxes next to these hosts in the list. Veeam Backup & Replication will not deploy or update its components on excluded hosts, although such hosts will be available in the SCVMM hierarchy. If necessary, you can instruct Veeam Backup & Replication to install components on hosts that were initially excluded later. To do this, open the Backup Infrastructure view, in the inventory pane select the added SCVMM or Microsoft Hyper-V cluster. In the working area right-click the Microsoft Hyper-V host and select Properties. If you add a standalone Microsoft Hyper-V host, in the Max concurrent tasks field specify the number of tasks that the Microsoft Hyper-V host must handle in parallel. If this value is exceeded, Veeam Backup & Replication will not start a new task against the Microsoft Hyper-V host until one of current tasks is finished. Veeam Backup & Replication creates one task per every VM disk. By default, the Max concurrent tasks value is set to 4. Limiting the number of concurrent tasks may be necessary if you plan to work in the on-host backup mode (where the Microsoft Hyper-V host performs the role of the default backup proxy) and want to balance the workload in the backup infrastructure. 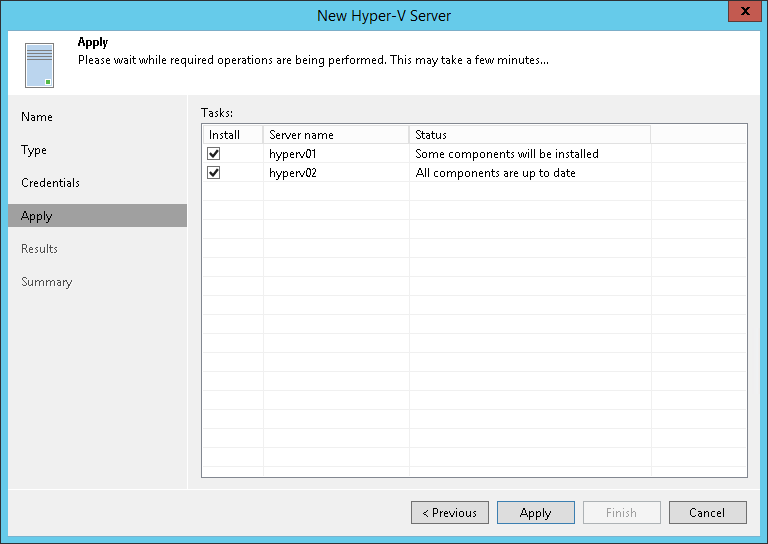 The Max concurrent tasks field is displayed only for standalone Microsoft Hyper-V hosts. To limit the number of concurrent tasks for hosts managed by SCVMM or Microsoft Hyper-V cluster, you need to set this value in settings of each Microsoft Hyper-V host in the SCVMM hierarchy or cluster separately. To do this, open the Backup Infrastructure view, in the inventory pane select the added SCVMM or Microsoft Hyper-V cluster, in the working area right-click the Microsoft Hyper-V host and select Properties.